Viewers will be craving for night snacks with their stomachs growling, as the popular “Let’s Eat” series will soon make its return. 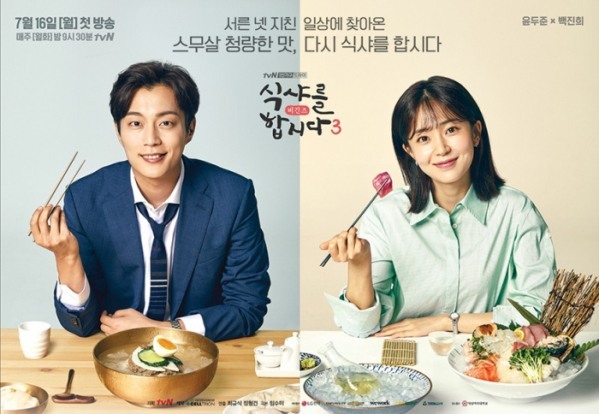 The third installment of the series “Let’s Eat 3: Begins” will soon start airing after a two-year break. Going back to 2004, when the lead character Goo Dae-young was a freshman, the story describes how Goo learned to truly appreciate food under the guidance of a classmate who is a food connoisseur. “The third season is to showcase summer cuisines, bringing back the appetite that was lost due to the hot weather,” the producer said. Yoon Doo-joon of K-pop act Highlight has been playing the lead role Goo for the three consecutive seasons. He has now become a symbol of the series. The Monday-Tuesday series is likely to be Yoon’s last work before he joins the Army. The enlistment date hasn’t been set yet, but he is likely to enlist sometime this year. The producer revealed his will to wait for Yoon for the next season. “This show is now unimaginable without Yoon. If the third season garners good responses, the fourth season is likely to come. We will wait for Yoon,” Choi said. “I was happy to feature in a series that I liked so much. Seeing Yoon eat in front of me was like watching TV at first,” Baek said, explaining that her role is the food connoisseur friend who guides Yoon to the way of being a foodie. The series, staring its first season in 2013, reflected the trend of emerging single-person households and the popularity of food-related videos. It has been well-received by viewers for introducing delicious dishes and the stories behind them. The 16-part show will air its first episode on Monday at 9:30 p.m.